Fluid Side’s signature stream-lined design and breathable elastomeric mesh back provides quality comfort for its users. For orders less than 2 chairs, a cartoning surcharge of $22 net will be incurred. 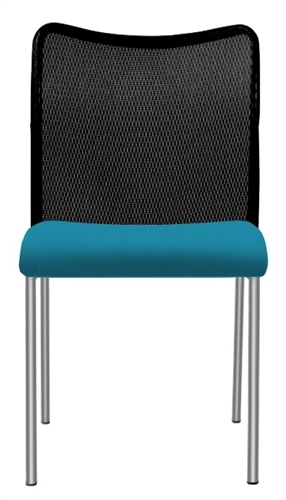 Flexible elastomeric mesh back stretched over tubular steel frame, upholstered seat, sleek nylon arms in black. Fully Loaded Stack 10 on a Dolly/ Dimensions: 66"H, 24"W, 36"D. Stacks 5 on the Floor. Fluid Side stacks 2 high with casters. Overall No Arm: 32"H, 18"W, 24"D. Seat: 17.5"H, 18"W, 18.5"D. Back 14.5"H, 18"W. Overall with Arm: 32"H, 24"W, 24"D.